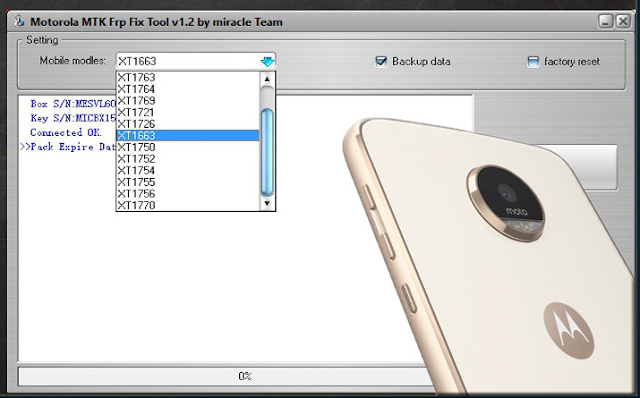 Miracle MOTO MTK FRP FIX TOOL 1.2 Beta is a application for windows computer, which allows you to Unlock the FRP from Motorola MTK Based Android Smartphone and Tablets Miracle MOTO MTK FRP FIX TOOL 1.2 Beta This Tool works with Miracle Box /Dongle It's free tooll for miracle box user Download this tool if you have any Motorola MTK based Andriod phones on FRP Its latest version is released and available for directly download from our website. If you are interested into download the latest Miracle MOTO MTK FRP FIX TOOL 1.2 Beta than simply follow the link given at the bottom. It is free to download and very easy to use. So download and enjoy Miracle MOTO MTK FRP FIX TOOL 1.2 Beta on your PC. # One Click Unlock Solution. Copyright ©: Miracle MOTO MTK FRP FIX TOOL All rights reserved Miracle Team.